Chiang Mai’s Dara Academy students are No. 1 in Croatia! Marvin likes bugs and recently he has been collecting a lot of them. I think that it is very good that Marvin is interested in learning about them and now he knows a lot about bugs. I am proud of him because he is always gentle with them and he only keeps them for a short time before he puts them back where he found them. Marvin is also very, very, very careful when he is looking for bugs because we talked about how some of them are poisonous. That means if they bite you, you will get very sick. We also talked about how snakes like to hide in the same places as bugs sometimes and they can be extremely dangerous, so Marvin doesn’t look for bugs on his own in our garden. He always makes sure that he has an adult with him. He says it’s more fun looking for bugs with someone so he likes this idea. 1) Why did the banana split? 3) How do you make a sausage roll? 4) What do you call two rows of cabbages? 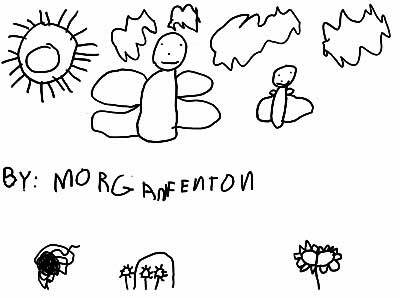 This week we have a picture from Morgan who is in Kindergarten. She likes to collect butterflies. Can you see them in her picture? The Senior Year has always been a year of many changes for every student, no matter which nationality. During this last year at high school, which seems to fly by for students as well as for parents, they face many new challenges, make wonderful friendships and in the back of their minds they are excited and fearful at the same time, thinking of the time ahead. In CMIS, the graduation is treated as a family celebration. 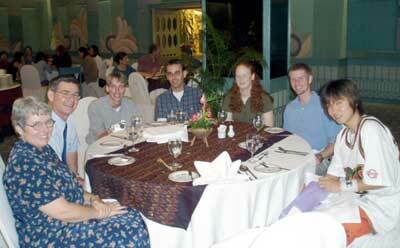 The parents of the CMIS Class of 2003 hosted a graduation day buffet luncheon at the Amari Rincome Hotel in June which was attended by the students and close family members. It will stay in their memories as one of the last occasions when the whole class was able to spend some hours together before moving on to their different universities around the world. Hopefully they will all see each other again at the first class reunion in 10 years. Students from Dara Academy Chiang Mai were the Thai representatives to display their research project to the GLOBE competition in Croatia. The Dara student team had been selected to represent Thailand and show their research project titled, “The Effect of the Physical Properties of Soil on the Soil’s Water Drainage” at the GLOBE competition at Sibenik in Croatia June 27 - July 6 this year. The student team consisted of Patcharida Boonkoat, M.1 Grade, Phongsathorn Hongthongkham, M.2 Grade, and Kritpongphan Phongsuwan,M.2 Grade. Phongsathorn Hongthongkham said that the Thai project was the result of cooperation between two schools - Dara Academy and Ban Yang Sung School from Kanchanaburi. It took 10 months for experiments to collect the data, requiring comparison of the grounds in three different areas. These results should bring in advantages farmers in the future. 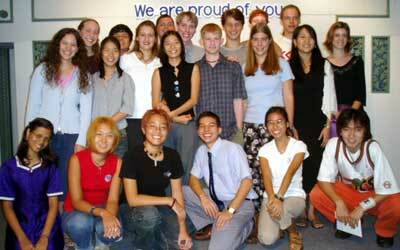 About 66 schools in Thailand were supported by the GLOBE project, to research soil, water and atmosphere. The new Youth Music School was recently opened for children to take part in the Youth Music Project, supported by Payap University’s Faculty of Musical Arts. Little musicians display their talents. Music Department students sing at the opening ceremony. The piano room, one of the many private practice areas available to music students at the school. The opening ceremony was preceded by musical performances by young musicians learning at the institute. All the players are instructed by students from the Music Department, one of the more popular faculties at Payap University. There were also performances from the Payap Band and Payap University’s Music Department students. 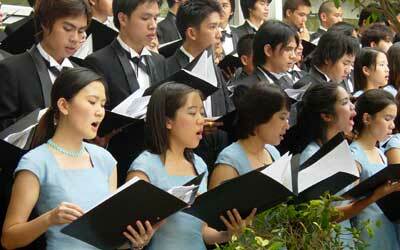 The music school is located on Kaew Nawarat Road, Muang District, Chiang Mai, next to Prince Royals’ College. 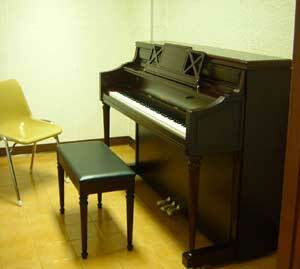 There are many private practice rooms for pianists, violinists, and many other rooms for music students. 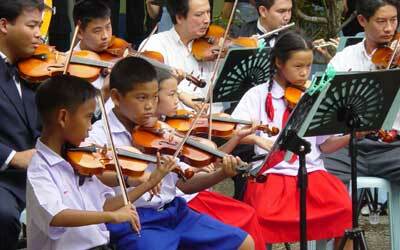 All the students, children or adults, pay only 500 baht per month for tuition from the Music Department.